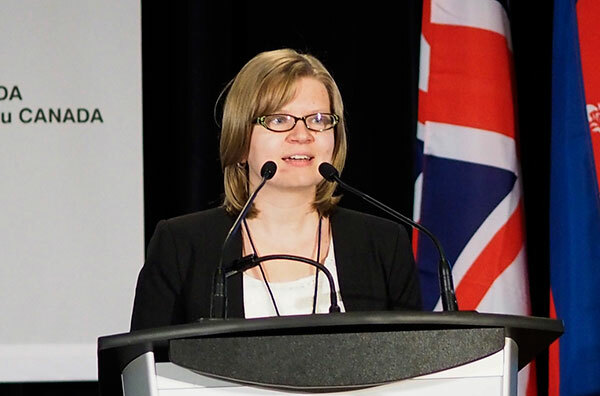 VANCOUVER – On Sunday, Deacon Jennifer Shack presented an essay outlining the history and biblical foundation of the diaconate in Lutheran Church–Canada (LCC), and the role of its members in our church body today. In part one of her presentation, Deacon Shack reviewed how the position of deacon was established in LCC, beginning with a Task Force struck in 1993 to study the role of congregational workers (a role that had been in existence since the 1950s). The official diaconate of Lutheran Church–Canada was established in 1999. Church work training programs were introduced in Canada in 1989, and deacons became rostered members of the synod in 2002. Using several New Testament references, the Biblical foundations of the two offices of “overseer” and “deacon” were compared. It was noted that the New Testament deacons held a secondary leadership position created to meet the needs of the local congregation, and examples of this office were cited. Deacon Shack’s full presentation (both text and video) will be made available online at a later date. Also of note regarding the diaconate, Sunday saw the Convention adopt a resolution “to study and provide for diaconal voting at Synod and District conventions.” Currently the voting structure allows for equal representation from parishes regardless of size, and equal pastoral/lay representation (one pastor and one lay representative from each parish), but does not make allowance for deacons to vote. The resolution calls on the CCMS to prepare a report on recommendations which would “preserve our fundamental principles of governance while providing voting privileges for deacons.” The report is due for 2017’s convention. Earlier on Saturday, the Convention voted to make provision for deacons to serve on Synod’s boards, commissions, and committees.